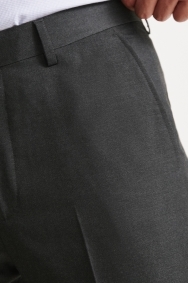 These half-lined, regular fit charcoal trousers from Moss Esq. are a great contemporary option whether you’re making for the office or a restaurant. Flat fronted and cut for a regular fit, pair them with a sky blue shirt and brown Derbies for a reliable formal look. I ordered a suit for my wedding when it arrived it was a totally different size then what was on the invoice sheet. Had to rush somewhere else to try and get a suit. I wont be shopping again in this shop. Very good. Look very smart on it. I have written three email queries regarding an update for my order. I have not received my order and I have not had the courtesy of a response. it has been almost 2 weeks since the order was placed and as a repeat customer I am disappointed by this poor business practice. I will be contacting my credit card company to reverse the order as no product has been shipped to me and no communication has been provided regarding the order status. Quality was good but they were too small for me. Just as expected and required, these are a spare pair for my current suit. Feel comfy and fit nice. They're in my suitcase now as I'm going on an overseas business trip. Quality clothing and in the sale, at a very good price! Great quality suit at reasonable price. Already stated earlier. Out dated. Good service, quality ok, very satisfied. Trouser fitting is loose for my liking. I prefer a more slim fit option. Good fit and nice design for work. Clothes as excellent as ever. It's a great Fit for something of te shelf !! Great fit and perfect style-look really smart. Good trousers that required not alterations to the leg length. The deal was great, but as I couldnt try the exact same suit in store, it ended up too big and the wrong fit for me. As per comments for the jacket. O estilo ficou perfeito em mim! Work trouser at a reasonable price. Very pleased with the products and at a very reasonable price. I love the cut, just that for the same size in slim fit doesn’t fit. Exactly what I needed a great fit. They fit well .. good material !!! Excellent service and suit is fab. No issues, length just right. Always great service, items are good fit and quality. Very good value for a suit. Cannot rate this as I haven't yet received it! good value for money, especially in the sale ! Went with the suit jacket I just bought ! Suit fitted perfectly and looks good on. Great fit well made suit and above the quality of material was expecting for the price. Fitted great. Son loved his new suit. The waist size is larger than similar size trousers that I already have. Excellant quality. Very pleased with Julie's recommedation. Good pair of trousers in the right size. Trousers are smart and look nice. Nice trousers well cut and a good fit. Good condition and well wrapped up. 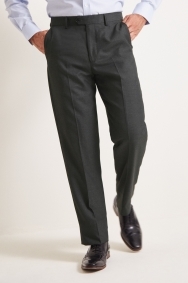 Perfect fit trousers, well tailored and highly recommended to anyone who wants to look perfect. Great length and lovely colour very easy to wear all day and night. Perfect fit and very smart and comfortable. Fit's perfectly and very good quality. The quality of the suit is superb! Great stuff. The trousers were excellent quality and style Sadly it was let down by the fit. The legs are v long for a pair of SHORT and the waist is snug to say the least. Possibly a little longer in the leg for a regular fit that i usually purchase but a good fit otherwise. Well made and comfortable to wear. Was the perfect choice for three occasions. Bought the suit with free extra pair of trousers. Able to choose precisely the size I wanted and received in a couple of days. Like the jacket they were a little long but easily sorted and look and feel great. Good quality, colour and sizing. Love it. Good fit, length and value. good, comfortable fit, and it even makes me look almost human! Good quality & fit but the short length was still a little too long for me. Perfect fit, very good quality. Nice fit with a quality feel. Lined in the thigh region for that extra comfort. Purchased an extra pair for the suit. The suits were excellent. Very high quality and well cut tot he point that I received a number of queries about where I got them. I will certainly use them again. Very happy with garment, good value and fit too. amazing value for the low price. The trousers make a good 'one off', light weight suit purchase. I usually struggle to find trousers in the right dimensions - big enough for my ample waistline, short enough for my wee legs, but without the legs flapping in tbe wind like yacht sails. These are spot on. I need a slightly larger waist size, but overall the measures are right. Yes, I like this as well. Packaging kept trousers in excellent shape, length is perfect, not a single change to make, what a great thing! Lovely smart trousers. Excellent price. Excellent fit, really pleased, good quality trousers, and well made - especially considering the low price. Would recommend to others and would order from Moss Bros again. Trousers fit well & are comfortable. I was able to get them adjusted thanks to Abdul's advice about a nearby tailors. Ben was very helpful, made sure I was informed at every step and found a suitable option for me. An extra pair of trousers as a bonus which prolongs the life of the suit. Good quality and great value for money Moss Esquire suit! Fits perfectly. I've not looked this smart in years! The suit is a good fit and comfortable. Very impressed with the item I ordered which is exactly what I required. Excellent value for money. Fits perfectly. Very pleased with quality. Excellent quality for money paid. Good fit and looks good for work. No problem with anything, fit perfect. Similar to the jacket, very pleased. Would prefer option of pleated trousers. But the cut is good. Very good. Excellent customer service.